(Phys.org) —A project that presents a concept of something between drone and satellite is under way. The vehicle is called StratoBus, developed in Europe. The StratoBus will be able to carry out missions such as border and maritime surveillance, telecommunications, broadcasting and navigation. Potential applications include boosting GSM network capacity for public events and GPS augmentation over dense traffic areas. The shell fabric is made of braided carbon fiber. The StratoBus will be able to carry payloads up to 200 kg. The first prototype is planned for rollout within the next five years. StratoBus is described as an autonomous stationary platform and the company emphasized its two notable features, the ability to carry out long endurance observation and complete autonomy from a fixed position. 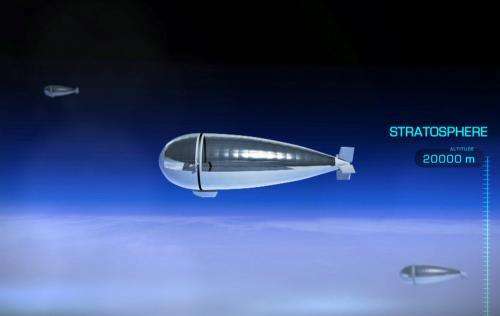 StratoBus will be operating at an altitude of about 20 kilometers, the lower reaches of the stratosphere but above air traffic and jet streams. The airship measures 70 to 100 meters long and 20 to 30 meters in diameter. The company said its design carries "technological innovations," in particular to make sure it captures the sun's rays in all seasons; a power generation system coupling solar panels to a solar power amplification system; and a light reversible fuel cell for energy storage. The company said the StratoBus platform will require continuous, significant energy input to offset the wind. Two electric motors will automatically adjust their output power depending on wind speed, up to 90 km/h. An alternate would be to use a semi transparent skin to capture solar energy and focus onto a thermal mass to keep the internal temp higher than ambient. Something like Qualcomms Mirasol would allow you to direct any light onto your internal thermal mass yet keep light from escaping through the other side. It would also happen to allow you to change the color or the outside skin to match background in real time. There's a problem: These things want to be as light as possible. So carrying around a thermal mass is a no-go. I like the semitransparent/rotray design with the concentrator. That's clever. But is it just me or does 90km/h holding velocity seem a bit low? I was under the impression that winds at that altitude can be quite a bit stronger. They say it's around 10-50 m/s, which might be a problem even though the frequency for 30+ is presented as low. 200kg payload isn't much when you're dealing with telescope optics for that. A multi kilo-tonne telescope on the ground will beat that any day. Unfortunately, due to NASA budget cuts, it will be grounded in 2015. @ Returner-Skippy. I am not really the scientist but a lot of people make that mistake because ol Ira use the google me. And the google tells me they are already doing that thing. They been boosting up the telescopes on the balloons for a long time, maybe 80 or 70 years yeah. Some they put at 60 km is what the google says on the wiki place. You are going to have to figure how many miles that is on your own but I don't think it is high like the space station place is where the Big Hubble thing is. The google say that one is big as a truck so it probably not fit on the balloon, eh? Laissez les bons temps rouler Returner-Skippy and did the Really-Skippy talk you into putting the pointy cap on for him? Ol Ira will have to speak with him about that because it's not allowed no.